When you buy a new truck, you can expect it to run quite a few months or even years – before it starts giving trouble. Just like any other vehicle, trucks consist of mechanical and electrical components that wear out or malfunction with time. It will be unfair to say your new truck might not give you trouble at all. When the time comes, it is essential you have a good Truck Repair Service to counter unexpected repairs. So, without further ado, let’s look at these tips on selecting a good repairing service for your truck. When you begin your research, it is imperative that apart from searching online you get a few recommendations from your friends, colleagues, or family members who might have had their truck repaired recently. 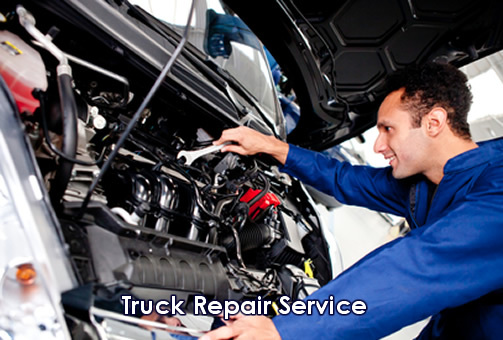 This way, you can get good names for the best Truck Repair Service located within your area. Once you get a few good names, search online to see if you can find a website. Go through the websites and look for testimonials. Read customer reviews to get a better idea regarding whether or not the mechanics are capable and experienced enough to handle all types of repairs on trucks. After short-listing a few names, it’s time go for a ride and visit some garages and Truck Repair Service shops. Consider the overall ambiance of the garage to determine whether you will get quality job done. Discard garages that don’t have a clean facility or lack organization. They can’t guarantee professional quality of work, if they can’t keep their workplace clean. Instead, look for a professional that has a clean, organized garage. The place ought to be comfortable and neat for waiting, while the professionals work on repairing your truck. When you are searching for a good Truck Repair Service, don’t always go for the least expensive mechanic. Sometimes a quality job requires paying a good price. Those who offer getting the work done for less may not repair your truck fully, which means you might have to visit them several times before actually getting the truck repaired. At the same time, don’t go for a mechanic that charges too much. Rather, go for one that is fair on the pricing. It is also advisable to compare pricing of different service centers to find one that best suits your requirements and budget. Therefore, now that you are familiar with the tips mentioned above, choosing a good Truck Repair Service won’t be a problem.